As we are consuming our natural resources, which are depleting day by day, a day will come when our natural resources will be hard to find or eventually disappear. The increasing demand and overuse of natural resources, especially natural petroleum such as diesel and petrol, leads to a rise in their prices on a daily basis. Consequently, it causes an increase in cost and expenses in the automobile industry as we speak. In order to avoid any further fuel cost increase, we require such methods in the automobile systems which would be able to optimize the automobile fuel. The fuel economy standard remains a challenge while it continues to promote optimization and sometimes (although in rare occasions) novel architecture that combines internal combustion engines (ICE) with various forms of electric vehicles. Different types of electric vehicles, such as a hybrid electric vehicle (HEV), are the best fit for the ICE in the coming future. Therefore, it appears that there is a trend of ample availability in hybridized powertrains, which are used as the Integrated Starter Generator (ISG). IGS tends to replace the conventional starter alternator (generator) and motor. Beside its basic function (motor and alternator), IGS provides an automatic start-stop system for fuel-efficient vehicles. Another problem to be considered in vehicles is the transfer of oscillation from car to passenger during the “start and stop” process. The IGS is also used for damping these oscillations. The electronically controlled integrated starter generator, as its name implies, replaces both the conventional generator and the starter of a vehicle. Ability to eliminate slip rings and brushes present in some wound rotor alternators. The ISG fundamentally works as a bi-directional converter for converting mechanical energy to electrical energy and vice versa. 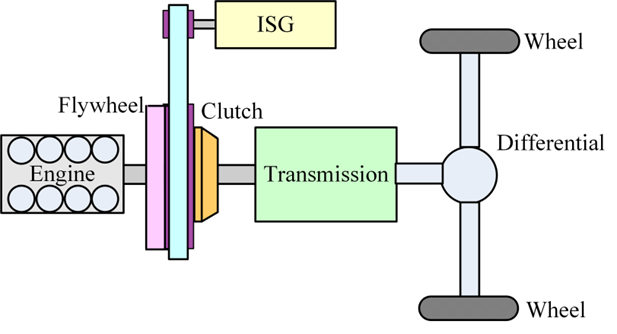 In many cases, ISG is located (sandwiched) between the engine and the transmission. The ICE is turned off through the ISG in order to conserve energy at stops and then starts immediately by pressing the gas pedal. So we can say that after stopping for a long time, when the vehicle is no longer in motion, the car engine completely shuts off with the help of the ISG,And when the driver starts the accelerator, the ISG starts immediately without any oscillation. In the “Engine Cranking” mode the starting speed is provided through the battery with the help of the ISG. Once the maximum speed is achieved, ISG power supply is turned off. However, another great advantage is the fact that the driver would not feel any difference, mainly because of the ICE starting independently by the ISG. The engine completely goes off instead of idling, by using the ISG, which is a very helpful feature while driving in urban areas. No wear and tear components in the ISG. Good serviceability, reliability, acceptable cost, etc. Directly connected to the crankshaft between the engine and the gearbox. MATLAB/Simulink model for studying the ISG system consists of a different subsystem, which includes a specification of vehicles. Indicated torque submodel is shown in Figure 4. At the start, the torque from the ISG is at maximum in order to provide sufficient speed to the crankshaft. As the speed for the crankshaft is increased, the torque of the ISG decreases continuously. The thing which differentiates the ISG from other starters is that the ISG depends on the angular speed. Conventional starters relate to the gearbox through a flywheel because the speed is increased much more than with the ISG starter. With a developed design, we can see and verify our results. 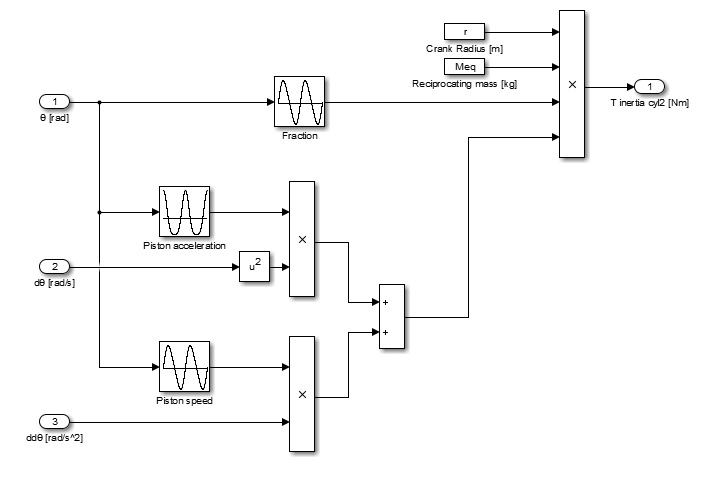 The results are obtained by simulating the design model in the MATLAB/Simulink. The blue line shows that torque without the ISG system becomes stable after reaching a peak but cannot come down to zero, whereas the pink line shows the torque with the ISG system, which is more stable and which comes to zero in a matter of a few seconds. The speed of the crankshaft is low at the start, but it will continue increasing as the torque of the ISG is decreased. The torque of the ISG is inversely related to the speed of the crankshaft. 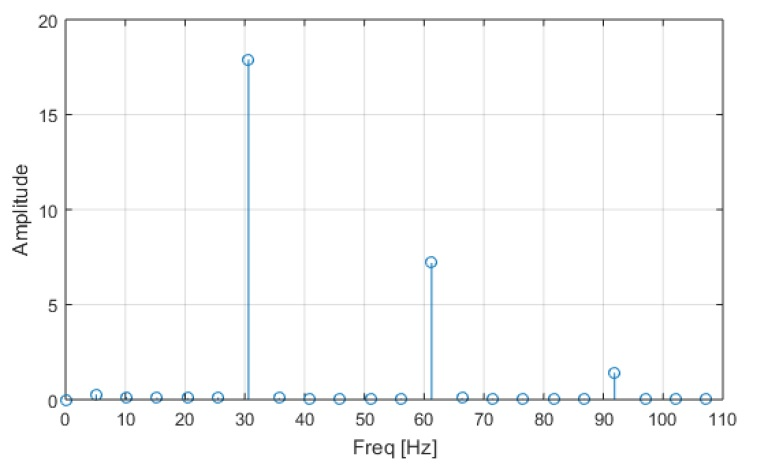 We can see that after the FFT we have specific amplitudes on specific frequencies – 5, 27, 31, 6 5Hz respectively. This is shown in the graph below. The average speed of the crankshaft is 698 rpm and the frequency is 35.9Hz. The main aim of the project was to simulate an engine start-stop system with the ISG in order to reduce the vibrations (oscillations) during the start and turning-off of the vehicle. The ISG system is the most effective in controlling these vibrations and damps them very quickly, in a matter of a few seconds. Lorand Szabo, Ioan-Adrian VIOREL, Cristian ŞTEŢ, Lars LÖWENSTEIN “Integrated Starter-Generators for Automotive Applications” ACTA ELECTROTEHNICA Volume 45, Number 3, 2004.